We have established this research project to attempt to clarify the conflicting information posted about James Kenyon White's marriages and children. All family researchers are invited to participate. Updates and summaries of the information gathered will be posted here for public access and use. Did James have four wives or five? If five, who is the unknown wife? When were they married and did they have children? Who is the mother of John Freeman White? Which of our conclusions can be confirmed? Challenged? What missing information can be discovered? More complete information about dates and places of birth? Of death and burial? Of the ancestry of James' wives? Do any photos exist of James and/or his wives? Stephen Davis is the grandson of S C Davis and Emma Cordelia White, daughter of James Kenyon White and Martha Grant. Stephen has DNA matched to multiple descendants of James Kenyon White and to descendants of relatives of Martha Grant. James White was born 15 July 1845 in Warm Springs, Meriwether County, GA - the fifth of six known children of James and Elizabeth White. We've chosen to use the 1845 DOB because that's the date James himself reported in 1921. However, his gravestone is marked July 15, 1846. James served as a Private in the Civil War from 1862 until General Johnston's surrender in May 1865 that helped end the conflict. James died in Shawmut, AL on 15 Feb 1925, where he is also buried. There is quite a bit of mis-information circulating about James, his four or five wives and twelve (at least) children. For that reason, we present a far more detailed analysis than is usually the case. Corrections and alternative theories are greatly appreciated. How Many Wives? Four? Or Five? Most researchers have identified (or partly identified) four wives for James. However, his great-grandaughter, Quintilla Verna (Strength) Smith (1909-1988), wrote in 1976 that he'd married five times. She named Mattie Huey as his fifth (and final) wife and Lucinda as his fourth (second-to-last) wife. She reports that her grandmother, Laura Alzora White, was the oldest of his ten children to live to adulthood - but doesn't mention the names of JK's first three wives. One of the goals of this project is to identify the possible missing wife. No other evidence suggests that one exists, but it's very difficult to prove a negative. Usually it's a pretty simple task to determine which child is born by which wife. However, we run into many problems here due to multiple marriages, missing marriage records, incomplete marriage records, missing death records - and perhaps even a missing wife. We have attempted to identify the mothers of JK's known and presumed children despite these obstacles. Many questions remain, but we believe this to be the closest-to-accurate accounting available. Information will be updated as missing pieces are uncovered by research contributors. It appears from the 1870 Census that a woman named Nancy, born about 1849 in GA, was probably JK's first wife. No marriage records have been found nor has a source of her maiden name. Most researchers identify her as Nancy Rebecca Baily, but the source of that conclusion is unclear. We do know that a Nancy Baily, who was born about 1849, was recorded in the 1850 Census as living in Meriwether County GA. Researchers also report that Nancy died about 1871, but no source for that information has been discovered. For example, no Nancy White or Nannie White (of an appropriate age) has been recorded as being buried in any Georgia or Alabama cemetery between 1870 and 1878. Gains White: About 1871 to ? 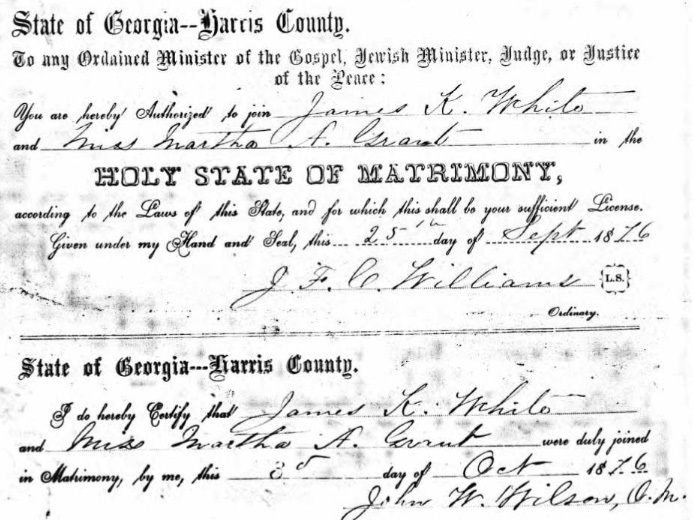 According to their Harris County GA marriage certificate, Miss Martha A. Grant was married to James K. White on 3 Oct 1876. Martha White, born about 1849 in GA, was named in the 1880 Census with James White, residing in Valley Plains, Harris, GA.
Martha Beatricia White was named as the mother of Emma C. (White) Davis on Emma's 1958 Alabama death certificate. We don't know Martha's date of death, nor when and why their marriage ended. However, her Davis and White descendants are DNA matches to many descendants of her Grant cousins. In addition to Emma, we can safely conclude that Martha was the mother of Mattie. Who was the Mother of John Freeman White? Nancy did not die until 1876 and Freeman is her son. The "missing" wife was James's second wife, not Martha, and Freeman is the missing wife's son. John was born out of wedlock to James and Martha, who married five months after his birth. Lucinda Smart married James on 30 Apr 1893 in Coosa County AL. She was 26; he was 47. Leves L White: 1906 to ? Although we don't have the exact date and place of their marriage, James reported in 1921 that he was married to Mattie in Sep 1908. No new children were listed in the 1910 or 1920 Census. A tenth child who lived to adulthood was Mrs. Almedia "Meta" Thomas, who died after 1910, probably in Columbus GA before 1920. James appears in every U.S. Census from 1850 to 1920 (1890 records were destroyed in a fire.) He lived with his parents in 1850 and 1860, but with his current wife and a number of children in every subsequent Census. James and his wife Nancy lived in Chalybeate Springs in Meriwether County, GA with their children. Numbers shown are approximate ages at the time of the Census. James and his wife Martha lived in Valley Plains in Harris County, GA.
James and his wife Lucinda lived in Tallassee in Elmore County, AL. Tener White	6 mo - Christina? Emma C White 12 - listed as a step-daughter; perhaps of Lucinda? James and his wife Martha S. White had been married about on year. They lived in Tallassee in Elmore County, AL. Martha was born about 1867 in Alabama; her parents were both born in Georgia. James lived in Shawmut in Chambers County, AL. No wife is listed, but he is shown as married. Note that Ludie Howard is JK's daughter; JH is her husband. Harvel is JK's son; May (Mae) is Harvel's wife.